Ultrasound is a wonderful technology and an incredible advance in veterinary medicine that has saved the lives of many animals. The ability to use ultrasound to look inside the abdomen or chest of an animal means that we can often quickly and non-invasively investigate a host of different health conditions. Abdominal ultrasound can be used to examine the liver, gall bladder, spleen, kidneys, bladder, prostate, uterus, ovaries, adrenal glands, stomach, and intestines. 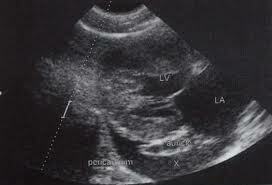 We can also use ultrasound to look at some of the structures in the chest. We can’t look inside the lungs, since ultrasound is impeded by air, but we can examine the heart and look for abnormalities such as fluid, enlarged lymph nodes, and tumours.